Indication: For increased rate of weight gain, improved feed efficiency, and increased carcass leanness in cattle fed in confinement for slaughter during the last 20 to 40 days on feed. The effect of zilpaterol hydrochloride on parameters listed in this table is supported by data generated at the dose tested in the clinical efficacy trials. Reduction indicates an improvement in Yield Grade. Zilpaterol hydrochloride has been shown to decrease marbling score when fed for 40 days. Dilute Zilmax Type A medicated article in a suitable carrier before addition to the final feed. A dilution of 1 part Zilmax Type A medicated article and 9 parts carrier (0.68 g zilpaterol/lb) is the suggested working pre-blend. Thoroughly mix the working pre-blend with feed to ensure complete and uniform distribution of the Zilmax Type A medicated article. Zilmax Type A medicated article and working pre-blend addition rates for complete feeds of varying dry matter are in the following table. Type B medicated feed may also be used after diluting Zilmax Type A medicated article before addition to the final feed. Thoroughly mix Zilmax Type A medicated article into appropriate feed ingredients to make a ton of Type B medicated feed (or Type B medicated liquid feed) according to the table below to obtain the proper concentration in Type C medicated complete feed (6.8 g/ton). Thoroughly mix Zilmax Type A medicated article into appropriate feed ingredients to make one ton of Type B medicated feed (see above). To obtain the proper concentration of zilpaterol in Type C medicated feed (from a range of 6.8 to 24 g/ton), the following table gives examples of how some Type C medicated component feed concentrations can be prepared from Type B medicated feed. Type B medicated liquid feed must be thoroughly mixed with other feed ingredients to make a Type C medicated feed before feeding. For Type B medicated liquid feed stored in recirculating tank systems: Recirculate immediately prior to use for not less than 10 minutes, moving not less than 1 percent of the tank contents per minute from the bottom of the tank to the top. Recirculate daily as described even when not used. For liquid feeds stored in mechanical, air, or other agitation-type tank systems: Agitate immediately prior to use for not less than 10 minutes, creating turbulence at the bottom of the tank that is visible at the top. Agitate daily as described even when not used. Directions to prepare a Type B medicated liquid feed are identical to directions for dry Type B medicated feed. See MIXING DIRECTIONS (COMPLETE FEED) for dry Type B medicated feed. Directions to prepare a Type B medicated liquid feed are identical to directions for dry Type B medicated feed. See MIXING DIRECTIONS (COMPONENT FEED) for dry Type B medicated feed. Feed continuously to cattle during the last 20 to 40 days on feed as the sole ration, containing 6.8 g/ton zilpaterol (7.5 ppm on 90% dry matter basis), to provide 60 to 90 mg zilpaterol hydrochloride per head per day. The amount of zilpaterol hydrochloride consumed daily by cattle will depend on the consumption rate of the Type C medicated feed. Zilpaterol hydrochloride consumption will range between 60 and 90 mg per head per day based on the Type C medicated feed consumption rates in the table below. Feed continuously to cattle during the last 20 to 40 days on feed, in a feed containing no less than 6.8 g/ton and no more than 24 g/ton zilpaterol (90% dry matter basis), to provide 60 mg zilpaterol hydrochloride per head per day. CAUTION: Not for use in animals intended for breeding. Do not allow horses or other equines access to feed containing zilpaterol. Do not use in veal calves. Not to be fed to cattle in excess of 90 mg zilpaterol/head/day in complete feed. If pen consumption of complete feed exceeds 26.5 lb/head/day (90% dry matter basis), zilpaterol should not be fed in complete feed. Animals receiving zilpaterol hydrochloride may exhibit increased respiratory rate as well as elevated levels of creatine phosphokinase (CPK) and creatinine. 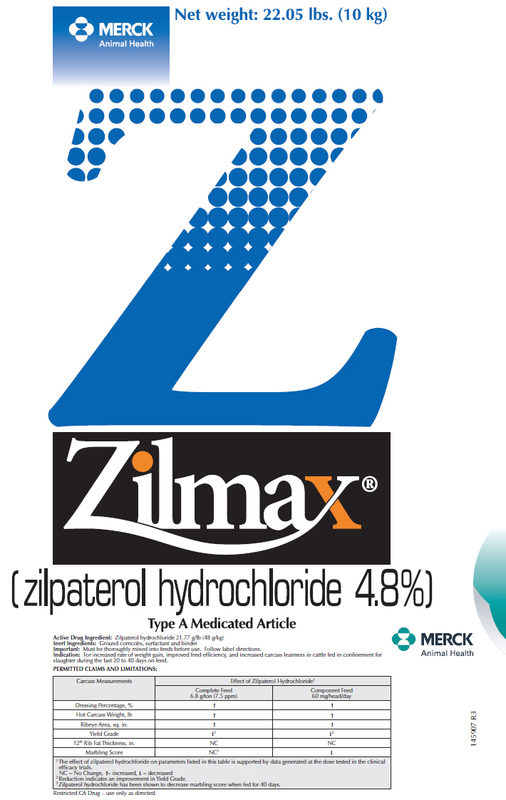 The active ingredient in Zilmax is zilpaterol hydrochloride, a beta2-adrenergic agonist. Not for use in humans. An anti-dust process has been applied to the drug product, Zilmax, in order to greatly reduce inhalation risk. Extended handling tasks with the potential for dust generation require respiratory protection. Wear appropriate skin protection (e.g., impervious gloves, apron, overalls) if there is a potential for extended skin contact. Wear protective eye wear, if there is a potential for eye contact. If accidental eye contact occurs, immediately rinse with water and consult a physician. FOR USE IN THE MANUFACTURE OF MEDICATED FEEDS ONLY. Store at or below 25°C (77°F). Limited exposure to higher temperatures (not to exceed 40°C (104°F)) is permitted. Restricted CA Drug – use only as directed.